The Institute of Weddings provides wedding businesses with a process to distinguish themselves as being trusted and reputable within the wedding industry. The IIW Trust Seal is a mark of distinction within the wedding industry. The Institute of Weddings Trust Seal is displayed only by IIW Accredited businesses, demonstrating the business’s commitment to professionalism, ethics, and integrity within the wedding industry. It indicates that the business agrees with, adheres to, and upholds, the professional standards, best practices and code of ethics prescribed by The Institute of Weddings. The Institute of Weddings Trust Seal on your site demonstrates to the bridal consumer that you have been reviewed, validated, and approved by an independent 3rd party organization which promotes best practices for wedding businesses and represents the standard of excellence within the wedding industry. Give your prospective customers the reassurance and confidence they need that your business is indeed the best choice for their wedding. The IIW Trust seal demonstrates and validates your accreditation by The Institute of Weddings, heightening your credibility and reputation, thereby making the process of customer acquisition easier for you. Apply for trust seal and accreditation now. The new accreditation process offered by The Institute of Weddings enables qualifying wedding businesses to set themselves apart for their commitment to upholding the highest level of professional standards, conduct and ethics in the industry. When you see The Institute of Weddings Trust Seal on a business’s website or promotional materials, you are assured of the pledge they have made to uphold the standards of professionalism and excellence within the wedding industry. They have met all requirements for accreditation by The Institute of Weddings and they are a member in good standing. Consider them a preferred vendor, retailer or service provider within the wedding industry. 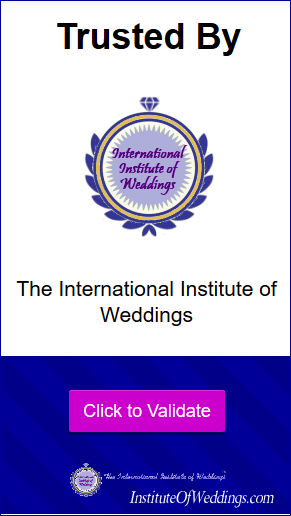 The Institute of Weddings Trust Seal on your website is the mark of distinction in the wedding industry™, communicating prestige and trust to the bridal consumer. Our accreditation seal proves to customers that your business adheres to The Institute of Weddings Standards, in addition to all local and federal laws and regulations. A trust seal from The Institute of Weddings heightens you credibility, enhances your reputation and gives you a competitive edge. Simply put, it can help win more customers for your your business and increase sales. Your accreditation with The Institute of Weddings translates into increased trust and credibility in the eyes of the bridal consumer. The International Institute of Weddings recognizes wedding-related businesses that meet and uphold the Standards of Professionalism, Ethics and Excellence as developed and prescribed by The IIW. Set yourself apart from your competition by demonstrating your commitment to ethics and excellence in the wedding industry through accreditation by The Institute of Weddings. Show bridal consumers that you support and uphold the Professional Standards of Excellence, Code of Conduct, and Principles of Integrity as prescribed by The Institute of Weddings. Apply for accreditation today. Display the Trust Seal on your website, advertisements, and promotional materials to reassure prospective clients that you have pledged to maintain the highest professional standards. Accreditation fees are intentionally kept very affordable in order to ensure that any legitimate wedding-related business meeting IIW standards for qualification has the ability to earn accreditation. With this low fee, there is simply no reason not to take the IIW pledge and get accredited. Its the most important day of a couple’s life – give them the reassurance they are seeking. Let them know they can entrust it to you through accreditation by The International Institute of Weddings. Seals are available in different sizes and styles to integrate cohesively with your website.